Diary of a Miner: Day 52: Okay... What now? I got the first half of the boat around the outside of the wall, and to the small bay the map had indicated on the opposite side. After positioning the boat piece, I stopped and looked around, noting how good this location was for possibly making a pier. It was protected from the main body of the sea, and had good cover from the land. But I had more important matters than making new piers. I untied the rope and went back for the second half. It was only a short walk, literally a few hundred metres, but with a boat piece to drag, it didn't half take a long time! Getting back to the other boat piece, I tied the rope around the front and began dragging it to meet the other half. After this I was probably going to have back problems... If I survived... After what seemed like ages, I reached the bay where the sand sloped gently downwards, making my job slightly easier. 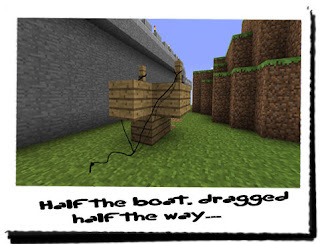 I lined up the boat pieces and untied the rope. Now all I had to do was reattach them again! I went back to the house to fetch some wooden planks, and returned with a few nails as well. I then proceeded to hammer the planks to both the inside and underside of the boat to put it back together again! It was crude and sloppy, but I hoped it would work. I pushed the boat out into the shallow water and waited a few minutes, looking into the boat to see if it leaked. After I was content with it not likely to sink, I went back to the house to retrieve the things I would need and to put the tools back. I was going to take food, my bow and quiver, the map and the diamond pickaxe. I needed it all to ensure the job was done. The sun hadn't even reached a third of the way into the sky yet, it was still mid-morning, which gave me a good chance I'd have the portal destroyed and be able to row back in a single day! Well, I would have to anyway; I had nowhere to stay even if it did get dark! I put the bag of necessary items into the chest I had carried across, and slung the bow and quiver over my shoulder. I left the map at the bottom of the boat so I had a good idea where I was going and I then pushed the boat out into deeper water. Getting in, I took up the oars and began rowing in the general direction the map indicated. The distance seemed similar to that between the ship and the campsite back on the island, however I didn't know if the map was entirely accurate in terms of scale. I kept stopping to take account of my surroundings, and compared it to the map. So far, everything seemed to match up, relatively accurately, so I continued rowing until I noticed a sandy embankment further along that appeared on the map. The embankment was quite close to the red circle, so it would merely be a matter of travelling North until I found the portal, destroy it and return. Then it hit me: what if the portal was buried? 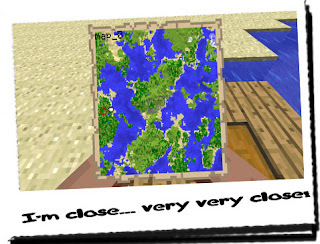 The map and the note hadn't mentioned if the portal was on the surface or not... 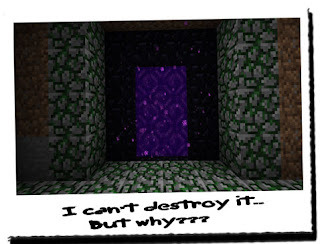 Thinking about it, I came to the conclusion that I would have to dig the portal out like I did with the last one. It wouldn't be exposed on the surface at all! I stopped the boat and dragged it onto the beach and then looked back at the map; a short walk North and then it was a case of matching landmarks. 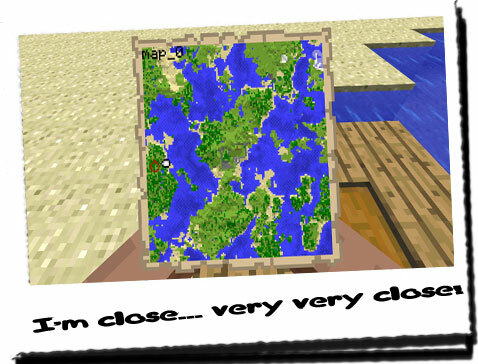 It seemed that there were a few pools of water to use as reference points, so it shouldn't take too long. I took the equipment and food from the chest and carried it, whilst holding the map in the other hand. I headed North, comparing the direction to the current position of the sun. After awhile, I noticed a small pool of water and instantly found its representation on the map. I was too far West, and would have to travel to the East a bit to compensate. After walking East for a few more minutes, I still hadn't seen anything to suggest a portal, or the presence of humans. It was actually rather frustrating. I stood still, looking around trying to do a comparison with the map, but the were so many trees around it was hard trying to get the lay of the land! Everything looked the same! I decided that it would be best to find a slightly higher point of view and began to walk towards a hill! At the top, it made absolutely no difference at all; the view seemed the same as it did back on the flatter parts. I stared at the map hard, trying to pick out any unique bits of detail, but the map was only being so helpful. The rest was up to me. I decided that it would be best to work my way back to the pool of water I had found, walk East for a few hundred metres and then start digging. I could expand the area outwards rather than down as I went, but if I didn't hurry I would have to make a return journey without finding it! I got back to the pool and began to look around. The sun was high in the sky, probably at its highest point, and I was having trouble finding East! Because of the trees, every direction looked identical, so I gave up trying and picked a random direction. After a few minutes, I noticed small details that told me I had been this way before; arrangement of wildflowers and boughs of trees. I decided to stop and I put the bag and the map down. I sat down and caught my breath; it was exhausting with all the rowing and walking. I'd need my strength if I was going to be mining as well! As I sat there, I noticed a strange noise coming from the South. It was an odd noise I had heard once before but couldn't quite place. Standing up, I removed my bow and readied an arrow, not knowing what to expect. I followed the direction the noise seemed to be coming in; a strange liquid noise, as though it was dripping into a well. There was an echo to it... It sounded like water, but not like water at the same time. There was also the sound of high-pitched rasping, or wind... Or something I couldn't describe! As I continued I came across a large pit in the ground; it was surrounded by high dirt walls, and had a cobblestone floor... Was it here? I couldn't see it, but I could still hear it! I walked around the edge of the pit until I saw the distinctive purple obsidian stone. The portal! I had found it! But... It was... Active? the sounds erupting from the portal were the same sounds that I had heard back in the temple before the figure disappeared through one. It also had the same shimmery purple liquid in the centre of the portal frame! Why was it active? How was it active? The pickaxe collided with the obsidian, but did no damage to it... 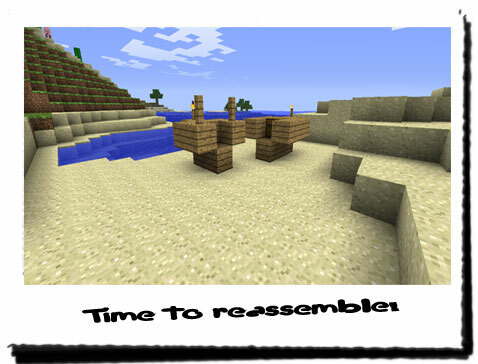 I tried again, raising the pickaxe and bringing it to bear on the surface of the obsidian... But again, no effect! I brought it up again, this time putting as much might as I could muster into the swing. The head of the pickaxe collided with the obsidian surface... And then shattered! The diamond head split and flew apart in a rain of rainbow shards, as light reflected and refracted from the many exposed surfaces! I stood in shock, starring at the remains of the pickaxe; the shaft no more than a stick, with no trace of diamond left affixed to it. The diamond shards littered the ground for a few metres. Diamond! The hardest substance known to man... defeated by obsidian... The portal... It couldn't be destroyed! But why? I had destroyed the previous portal in the exact same way, and yet this time it resisted! The only difference between this one, and the last... Was the state... 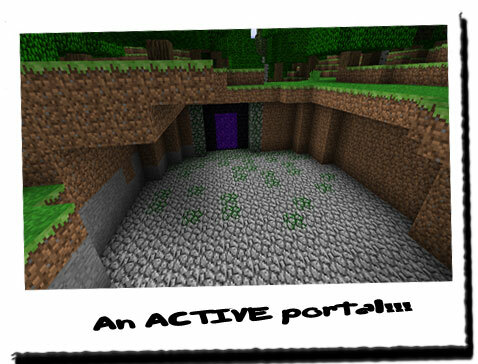 This portal... Was active! You can't destroy an active portal! If an active portal repelled diamond, it would definitely repel explosives! How was I going to destroy it? I stepped back, slipping slightly on the diamond shards... There was nothing I could do... I couldn't contact THEROS to say I had failed... HoN Co. would tell me I'm lying again... I did the only thing I could do... I ran! 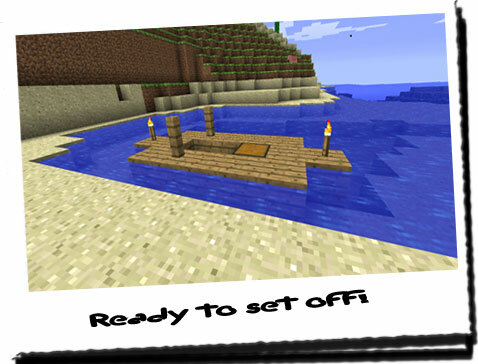 I ran back to the boat and pushed it to deeper waters! I wanted to be as far away from this portal as possible! I slowed the boat as I got to the bay, and pulled it to shore. I then sat there panting, trying to get my mind straight... The portal couldn't be destroyed... What more could I have done? I stood up, and ran towards the gate, and up towards the house... The only thing I could do was send the images to HoN Co. and to plead with them to bring a team down! I had proof of an active portal! They had experienced them before, they knew how to deal with them! It occurred to me that the finding of the portals might be why they didn't believe me; they didn't want to believe that another had been found. But I pushed it from my mind and continued with the message! If HoN Co. denied me an investigation team now, I was leaving this land! It's been a few hours since I got back. I've managed to calm down, and I've written a few things down in a notebook I made quite some time ago. I'm trying to recall all of the things in this land that haven't been documented. If I'm leaving, I'm going to make sure every miner going into Minecraftia knows about the perils of this land! HoN Co. should add protection to their training program; give the miners an opportunity to defend themselves, and learn how best to defend themselves from Creepers and other creatures... They should also include information about portals... And what to do if one is found! There should be a protocol about them, but when I learnt, we weren't even taught about obsidian. I learnt about it separately in my own time! Other miners won't have a clue! HoN Co. needs to send a team in to investigate this portal so they can learn how it works. It has been some time since they encountered the first one... They would have better instruments, and a better understanding... If they denied me an investigation team... I was leaving Minecraftia!